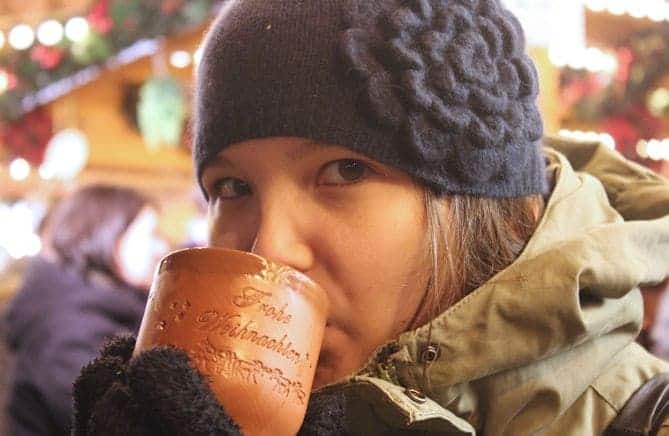 What to eat at the Frankfurt Christmas Market? For me & my family Christmas always starts at the Frankfurt Christmas Market. I written this post Christmas 2014 but because Christmas was almost over by the time I written it – so I thought to save it until this year. Unfortunately this is the first Christmas in my 30 something year old life that I will not spend in Germany; which the closer we get to Christmas the more devastated it makes me. However I really hope I can come back next year. The Frankfurt Christmas Market is one of the oldest in Germany and and originates from the 13th century. It counts as one of Germany’s largest Christmas markets with over 3 million visitors a year. The Market is located on the Römer Platz, the medieval centre of Frankfurt and is one of the highlights of my advents time. At the Frankfurt Christmas Market you can expect plenty of stands with traditional German souvenirs and of course a abundance of traditional German Christmas food. 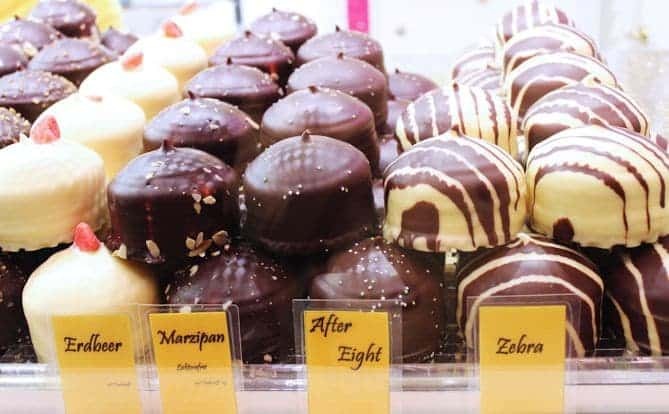 Because Frankfurt is my hometown and I had plenty of friends from abroad visit this market in the advent time, decided to create a little guide on What to Eat at the Frankfurt Christmas Market. This is not a definite guide and I hope to add to it over the years. Feuerzangenbowle is a traditional hot German alcoholic drink where the rum soaked sugar drum is set on fire and drips into mulled wine. You will find sugar coated roasted almonds at every German fun fair or Christmas market. It’s also a great souvenir to bring home. Katoffelpuffer is very often eaten at Christmas markets. You normally have a choice of either having it with Apple Sauce or a Garlic Sauce. I prefer Apple Sauce. It would not be a German Christmas Market without sausages of many varities in natural or artificial casings. The favorite is the Curry Wurst, a German Bratwurst with Ketchup topped with a special spice (curry) mixture. You need to try one of those! The chocolate covers sweet cream and there a lots of different flavours. I never had them outside Germany. If you want to go for the healthy option (ha!) then try one of those fuit sticks covered in a variety of different chocolates. Apfelwein (Cider) is a speciality from the Frankfurt (Hessen) region, and here on the Christmas market you can find it hot. Don’t miss out on this winter warmer if you want the authentic Frankfurter experience. A popular German bread spread made with lard and mixed with apple and onion cubes. Yes, I know you do not just find pretzels in Germany at Christmas but all year round. However at the Christmas market they are extra large. 2 Responses to "What to eat at the Frankfurt Christmas Market?" It looks lovely, Marita! I so hope to make it to a Christmas market this year ….